Review by AllTheBestFights.com: 2016-02-27, fast and furious start, high pace and spectacular exchanges: Leo Santa Cruz vs Kiko Martinez was an authentic war and it gets five stars; this is the first candidate for the boxing Fight of the Year 2016! The undefeated world champion in three different weight classes Leo Santa Cruz entered this fight with a professional record of 31-0-1 (17 knockouts) and he is ranked as the No.1 featherweight in the world. He fought three times last year beating Jesus Ruiz (=Santa Cruz vs Ruiz), Jose Cayetano (=Santa Cruz vs Cayetano) and Abner Mares (=Santa Cruz vs Mares). His opponent, the former Ibf super-Bw champion Kiko Martinez, has a boxing record of 35-6-0 (26 knockouts) and he entered as the No.16 in the same weight class. He fought four times in 2015 losing to Scott Quigg (=Quigg vs Martinez) but then he won three consecutive bouts. 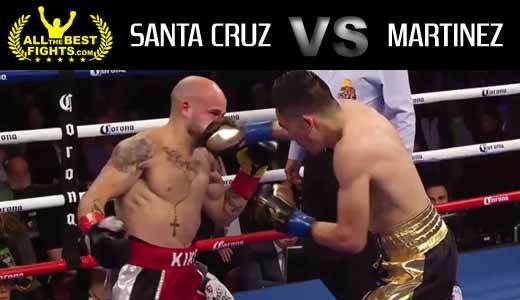 Santa Cruz vs Martinez is valid for the WBA Super World featherweight title. Watch the video and rate this fight!